Buy Aroma Magic Help Me! 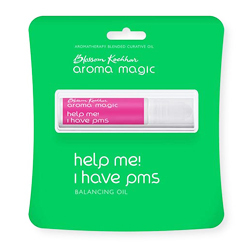 I Have PMS - Balancing Oil - Comfort you mentally & physically pre/post menstruation & menopause. An aromatherapy formulation made from essential oils of neroli, rose and ylang ylang. Potent blend of pure and natural oils relieves you and balances the monthly hormonal fluctuations, irritability, anxiousness or discomfort. Comfort you mentally and physically pre/post menstruation and menopause. Safe and natural with no side effects.